As I stepped into Eulogy, a new exhibition at Vane, I looked down. Every piece of artwork was below my waist. There was nothing on the walls. The empty part of the grey concrete floor that wasn't filled with tilted frames, small prints, and varied sculptures, made a winding path through the two compact rooms. Eulogy is open at Vane, a gallery on the first floor of the perennially to-be-demolished Commercial Union House in Newcastle upon Tyne, until the 17th of May, 2014. The exhibition is a collaboration between LUME Projects, a Newcastle based artist group, and Zara Worth, a British artist and writer. 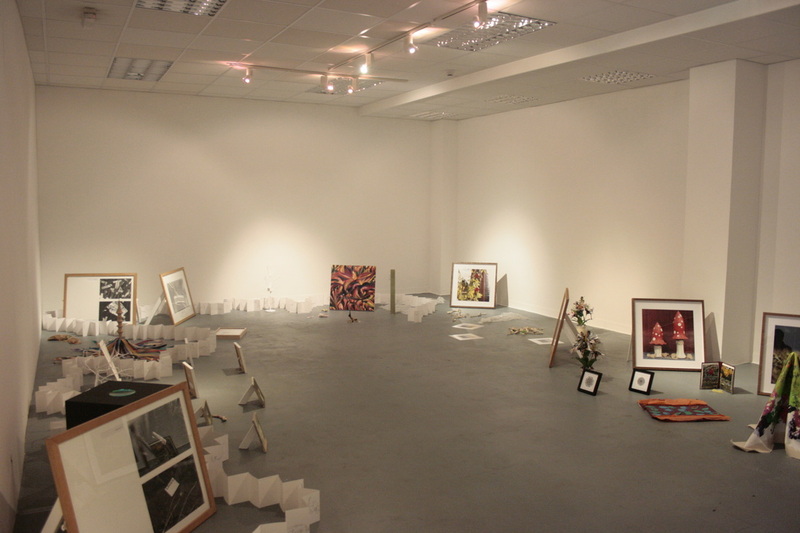 Eulogy features the work of over 30 artists. The A4 exhibition commentary explained to me that the layout of Eulogy should be looked at as a literal meadow of natural romanticism. Each piece was responding to the complicated, but enduring relationship artists have with nature, and that the title referred to the disappearance of nature in an increasingly urbanised world. The concept and layout immediately demanded my attention. The break from the typical eye-level presentation was refreshing. All of the disparate artworks loosely connected by the theme of "nature," suddenly became corralled through their shared layout and concept. I was also admittedly skeptical. The very intentional curation was so literal and apparent, that it threatened to overcome the individual works. Some of the art took advantage of the downward and winding perspective, but there were many that did not. The framed prints and photographs set at a slight angle seemed out of place. They rejected the novelty of the no-walls exhibition. As I sat down to write this review, I swiped back through a few photographs I had taken at the exhibition, and landed on one I had taken the day before. I had been walking on an unfamiliar path out of the city centre when I happened upon a back entrance to the All Saints Cemetery, and took a picture absentmindedly. It was just a flip of coincidence that the pictures of Eulogy and the cemetery were together, but it was only then that I realised how the teetering objects in Eulogy reflected those toppling stone graves. Perhaps it was an obvious premeditation by the curators, or just a coincidence. Either way, I felt the ideas of disappearing nature, and the sense of the exhibition as a eulogy begin to ring more genuinely. William Flynn is an American artist currently based in Newcastle upon Tyne. He is a student at Newcastle University in the Master of Fine Arts program. He is the founder ofwww.photistoric.com, a website that showcases historic prints and photography. You can find out more about his artwork at www.william-flynn.com.